This exhibition contains a new body of work that has been created in the context of my 2018 Barbican ArtWorks Fellowship, where I have sought to bring my work as an artist together with my engagement work describing art for people with visual impairments. This new work is part of my ongoing research into the emotional resonance of natural phenomena. It considers the brokering of colour through language and looks for a new emotional vocabulary. It also features work by invited artist Catherine Street. The exhibition runs 12–16 February, 11am–6pm each day. In the Frame Event, 14 February, 1–3 pm (featuring Catherine Street). 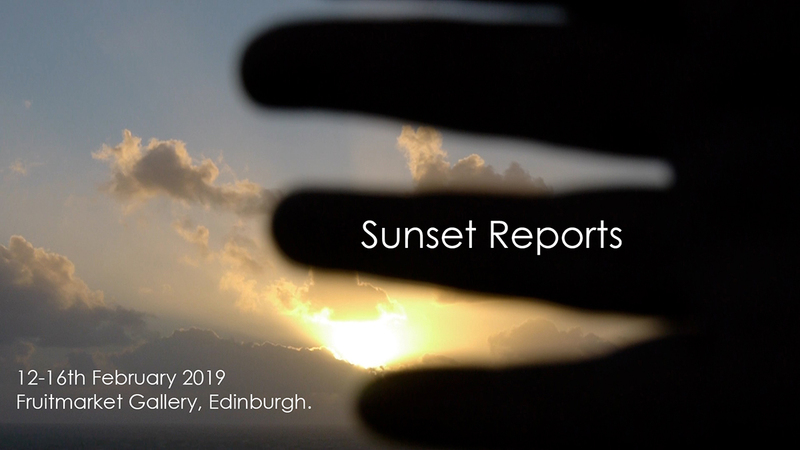 An inclusive event in Juliana Capes’s exhibition Sunset Reports, featuring visual description and new written works by artists Catherine Street and Juliana Capes. While we particularly welcome those who have a visual impairment, this event is free and open to all. This exhibition has been supported by The Fruitmarket Gallery, Creative Scotland and the Barbican Artworks Fellowship.